I was never a huge fan of shrimp. I would only eat when I had hibachi. My husband tried to get me to eat or make it ALL the time and I would constantly tell him no, because I don’t eat shrimp. Meanwhile I hadn’t had it since I was like 11 and I just resigned to the fact that I didn’t eat shrimp because I didn’t really eat when I was 11. I’m so mature. Little by little I would try it every now and then, and one day I realized, I actually like this. So needless to say I try to cook with shrimp more often because I know Matt really likes it, and I’ll actually eat it. I threw this over sautéed kale instead of pasta. And I know what you’re thinking… sautéed kale… again?! I swear I make more than just kale! 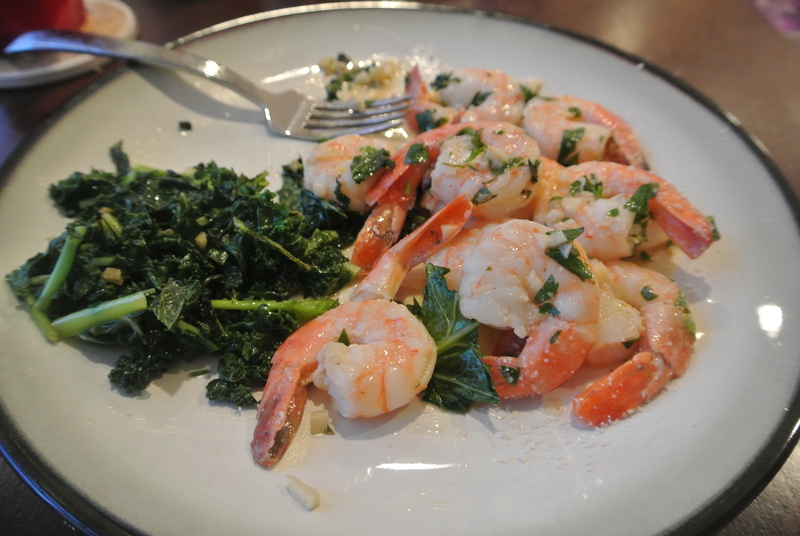 haha but I thought since we added lemon juice to the kale it would compliment the shrimp well, and IT DID! So hush. If you want the recipe for my sautéed kale go here. Step 2: Spoon out the shrimp with a slotted spoon and set them aside. Reduce the heat to medium-low, add one tablespoon butter until melted then add the garlic. Cook for about 30 seconds. Step 3: Remove the skillet from heat. Add lemon juice, chopped parsley, remaining butter, cayenne pepper, salt and pepper. Step 4: Return the shrimp to the pan, combine with the rest of the ingredients. Step 5: Serve over the side of your choice. And that’s it! It’s pretty easy. I’d say the most difficult part is making sure the shrimp is cooked all the way through and not overcooked. But this is a really delicious recipe. My husband added a sprinkle of parmesan cheese to his shrimp and it was really good, ha. Not paleo, but whatever. Hope you guys like it! Until next time, kisses!